Item Number: 26-7-01 17850 Actual Weight: 0.1 lb. Keeps files and paperwork together. Use to organize and store important files. 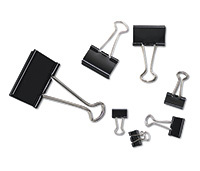 Steel clips are available in capacity up to 1".